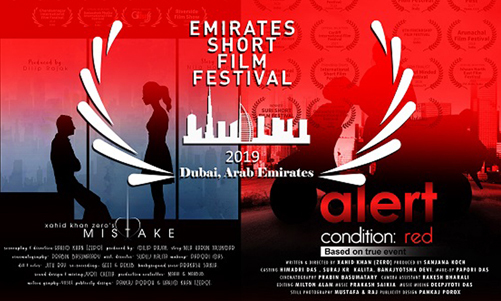 ‘Alert-Condition: Red’ and ‘Mistake’ to be screened at Emirates Short Film Festival in Dubai on February 26. Assamese director Xahid Khan’s two short films – ‘Alert-Condition: Red’ and ‘Mistake’ – have been selected to be screened at Emirates Short Film Festival in Dubai. Both the films will be screened on February 26, 2019 at VOX Grand Cinema in Dubai. The filmmaker also informed that ‘Alert-Condition:Red’ and ‘Mistake’ are the only films from Northeast India to be screened at the Emirates Short Film Festival. An elated Khan said he and the team members of both the films are “very contented for the official selection and screening of the films in such a high-tech theatre like VOX Grand Cinema”. ‘Alert-Condition: Red is a film about a young girl who stepped into adulthood. The young girl gets her first menstrual period in public place and she had to struggle with people’s bizarre look. She felt embarrassed and naive about her condition as she doesn’t know. She walks on to a scooty and sits there just to be relaxed. When the owner of the scooty comes and gets to know about her situation, he calls a stranger woman to rescue her. Both the man and woman helped her and sent her home. In the film ‘Mistake’, Paahi, a young girl, messaged her boyfriend but by mistake the message goes to her father who never had any hint about her boyfriend. When she realises that the message went to her father, she lost herself into the thought of her father’s act in response to her message and how would she face her father.